Relying on morphology in the estimation of postmortem intervals is not always accurate for all life phases of flies, especially for immature stages. The present study demonstrates the application of cytochrome oxidase I sequences, a partial mitochondrial (mt) gene region, to differentiate forensically important flies in Alexandria, Egypt. Thirty-three adult flies, larvae, and pupae were collected from rabbit carcasses. Nineteen were used for genotyping. Sequence analysis revealed no significant intraspecific divergence in Diptera species. Accordingly, a neighbor-joining tree using the Kimura 2-parameter model illustrated reciprocal morphology between species. Specimens represented five species, four genera, four subfamilies, two families, and one order. We herein identify five different Diptera species, Chrysomya albiceps, Chrysomya megacephala, Calliphora vicina, Lucilia sericata, and Ophyra capensis, using mt DNA as a species-specific marker for identification in a local database set-up. Forensic entomology is a powerful tool that can aid in estimating the minimum postmortem interval (PMI) of human remains. However, homicide victims may not be discovered for days, weeks, or months. The challenging step for forensic entomologists is larval species identification because many morphological similarities among closely related species make it difficult to distinguish them with precision. Published studies of forensically relevant flies mainly focused on Calliphoridae (Wells and Sperling, 2001),,,, as they are generally the first arthropods to locate and oviposit onto a corpse. Their common remnants in crime investigations are pupae and puparial cases. These can be useful for PMI estimation. Thus, crime investigations can benefit from molecular genotyping methods. DNA analysis can provide independent morphology verification and may even discover the presence of cryptic species when this would not otherwise be possible. Mitochondrial DNA (mt DNA) has a higher mutation rate than nuclear DNA, which increases the chance of generating species-specific markers. It also possesses both conserved and variable segments. In addition, mt DNA may be easier to isolate than nuclear DNA. A barcoding approach based on DNA may be useful for the identification of taxa, for which the use of morphology or the association of different life stages is problematic. Therefore, the present study involved mt DNA analysis of different developmental stages of forensically important flies, including pupae and empty puparia left behind after adult emergence. Among all the genes known in mt DNA, the cytochrome oxidase I (CO1) gene is considered the best to use. This gene is very well studied, and its size and structure are conserved in all aerobic organisms. It is often used in species identification. Highly conserved and variable regions are closely associated in the CO1 gene, making it perfect for phylogeny tracing. The goal of this study was to demonstrate that genetic identification of flies can be reliable, even from fragments or incomplete empty puparia, which is not achievable with morphological examination. Fly samples were collected from rabbit carcasses. The rabbits had been killed by cervical dislocation to avoid pain, in accordance with the Alexandria University Ethics Committee and NIH guidelines. Samples were divided into three groups based on morphology. Experiments were performed in the Faculty of Science, Alexandria University, Egypt. Group “A” contained adult flies, larvae, and pupae that we placed in killing jars. After immobilization, insects were dissected to isolate flight muscles that were transferred into Hood's solution (95 ml of 80% ethanol and 5 ml of glycerol). Some nondissected insects were placed into dry vials for direct pinning and further morphological identification. Adult flies, larvae, pupae, and empty puparia of group “B” were preserved immediately at −80° C for subsequent molecular analysis. Immature flies belonging to group “C” were kept alive and reared to the adult stage for species confirmation. We examined adult flies using a model U-TV1X-2 stereomicroscope (Olympus, Japan). Accurate adult identification was based on the work of Hinton, Smith, Mound, Greenberg and Kunich, and Castner. DNA was extracted from insects of different developmental stages using two extraction protocols. First, the conventional phenol/chloroform/isoamyl alcohol method was partially modified by adding 20 mg/ml of proteinase K and increasing the digestion time to 48 h to improve the yield. Second, the E. Z. N. A.™ Insect DNA Kit (Omega Bio-Tech, Norcross, GA, USA) was used according to the manufacturer's instructions. A total of 5–15 μl DNA with an absorbance ratio (A260/A280) of 1.7–1.9 was obtained. The extracted DNA was stored for 2 weeks at −20° C then re-suspended in 20 μl of RNase-free water. The DNA extracted fraction was spectrophotometrically quantified and diluted to a concentration of 100 ng/μl before polymerase chain reaction (PCR) amplification. The diluted stock was stored at 4°C to avoid DNA damage. Two attempts to amplify the mt gene were performed. First, we tried to amplify the whole region of CO1 using primers designed using Perprimer free software (Perprimer v1.1.17, Owen and Marshall copyright © 2003–2008). Second, we chose a region of CO1 according to previously published primer sequences on Calliphoridae, (Simon et al., 1994) [Table 1]. PCR was done in a final volume of 25 μl containing 1× PCR buffer, 2.5 mM MgCl2, 0.1 μM of each primer, 0.2 mM dNTPs, 1.25 units of Taq polymerase, and 1 μg DNA template. Amplification was performed using an Eppendorf Mastercycler (AG 22331; Eppendorf, Hamburg, Germany). The thermal sequence consisted of an initial step of 2 min at 95°C followed by 35 cycles of 30 s at 94°C, 30 s at 54° C, and 1 min at 72° C. This was followed by 10 min at 72°C and the final product was stored at 4° C. PCR products were visualized on a 1.2% agarose gel (1× TBE with ethidium bromide using a GeneRuler™ 100 bp DNA ladder). The most intensely stained products were selected for sequencing. Products were labeled using Big Dye ® Terminator v.1.1 Sequencing Kit (Thermo Fisher Scientific, Waltham, MA, USA), and sequenced using the ABI 33130x1 automated sequencer (Thermo Fisher Scientific). Nucleotide sequences were prepared and analyzed using Finch TV software (Version 1.4.0, copyright© 2004–2006, Geospiza Inc. Seattle, Washington, USA), BioEdite Sequence Alignment Editor (copyright© 1997–2007, Tom Hall, 1999), and Molecular Evolutionary Genetics Analysis (MEGA, version 4.0). DNA sequence reads were edited manually using BioEdite and were aligned using Clustal W in MEGA software. The phylogenetic tree was generated by the neighbor-joining (NJ) technique using the Kimura 2-parameter (K2P) model of substitution.Ophyra capensis was the out-group in all analyses. Maximum likelihood analysis was performed using the K2P model to compare the genetic distance between species using MEGA. CO1 data were obtained for almost all species, resulting in a nucleotide matrix that consisted of 1500 bp (http://www.ncbi.nlm.nih.gov/) and 300 bp. The sequence analysis was based on 300 bp. Only the smaller fragments (SFs) were amplified and sequenced, using published primers. When the amplified DNA was present, some amplifications of 1500-bp fragments were repeated. It was still difficult to obtain a sequence indicating that the region of interest had been amplified. Failures were associated with either a low amount of PCR products (indicated by a faint band in the ethidium bromide gel) or interference from nonspecific amplified products, resulting in a high background. Moreover, the nucleotide peaks were overlapping and were not clearly recognizable to be considered. Genotyping sequences were successful in only 19 of 33 specimens when SF-CO1 was analyzed, likely due to poor DNA quality. Well-defined nucleotide peaks were obtained, and electrophoresis of PCR products was performed, yielding an average length of 300 bp. The nucleotide composition showed notably higher frequencies of thymine (T) and adenine (A) (41% and 32%, respectively) when compared to cytosine (C) and guanine (G) (13% and 14%, respectively). The selected sequence of each sample, based on bands' sharpness and clarity, was chosen to undergo further investigations. Morphological identification of fly species matched the results based on genotyping. Accordingly, the specimens represented five species, four genera, four subfamilies, two families, and one order [Table 2]. For all tested samples of flies (n = 19), exact matching was aligned with the GenBank database (http://www.ncbi.nlm.nih.gov/BLAST/) with an average of 97.68% maximum identity. 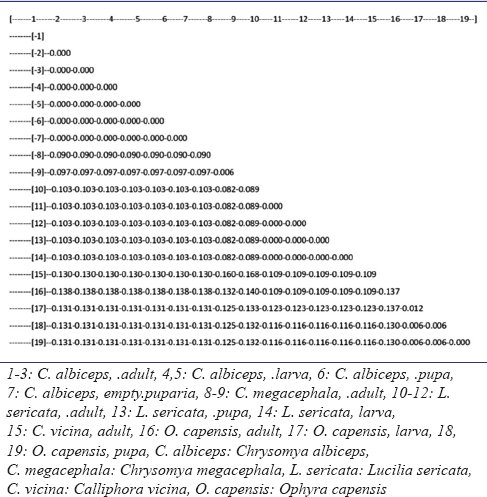 Newly determined nucleotide sequences, based on the sequence analysis and BLAST search of partial CO1 sequences, led to classify the flies into five species: Chrysomya albiceps (n = 7), Chrysomya megacephala (n = 2), Lucilia sericata (n = 5), Calliphora vicina (n = 1), and O. capensis (n = 4) [Table 2]. Pair-wise sequence differences observed for individual loci of CO1 are shown in [Table 3]. Within-group variation for all genera ranged from 0.0% to 0.6% with a mean of 0.24% for combined datasets [Table 3]. Calliphoridae between-group variation ranged from 8.6% to 16.4% with a mean of 11.4%. Variation between the Muscidae outgroup and the Calliphoridae genera ranged from 11.6% to 13.4% with a mean of 12.82%. The rate of increase declined in the higher taxonomic categories. We then analyzed the genetic distance observed as measured by the percentage divergence between sequences. The most notable finding was the very small divergence (8.2%) separating Ch. megacephala and L. sericata. This was lesser than the amount of interspecific divergence (9%) separating Ch. megacephala and Ch. albiceps, which is considered the lowest interspecific variation. Levels of interspecific variation between Calliphoridae species varied from 8.2% to 16.8%. Species pairs such as Ch. albiceps/Ch. megacephala were separated by 9%. At a higher level, the subfamilies Chrysomyinae and Calliphorinae displayed 13%–16.8% variation while Chrysomyinae and Lucilinae displayed 8.2%–10.3% variation. Subfamilies Calliphoridae and Luciliae displayed a difference of only 10.9% [Table 4]. The tree produced using the distance analysis method yielded highly similar topologies. Values were provided on the same K2P-NJ tree [Figure 1]. The subfamily status was well supported, with Lucilina, Chrysomyinae, and Muscidae displaying 100% support in all analyses. Chrysomyinae species was grouped together with 58% support and C. vicina was represented by 50% bootstrap. In almost all analyses, individuals of each species received 100% bootstrap support, indicating a strong basis for species distinction. For instance, in the phylogenetic tree, Chrysomyinae species were determined as the monophyletic group having strong bootstrap support. A major discrepancy between results was observed in the grouping of O. capensis individuals (different developmental stages), within which the subbranching between adults, larvae, and pupae was supported by a 52% bootstrapping value. Intraspecific values were relatively low. Maximum values observed between individuals of each species are displayed in [Table 4]. The highest level was observed in Ch. megacephala and O. capensis at 0.6% in individuals collected at different developmental stages. Very little intraspecific variations were observed in each of the Ch. albiceps (at 0.3%) and L. sericata (at 0.0%) individuals collected at different developmental stages. The morphological similarity, especially between immature stages, poses a great challenge for forensic entomologists. The identification of immature Diptera by their DNA sequence has the advantage of speed and simplicity. Furthermore, species can be identified from partial remains lacking morphological character. Contrary to the long DNA fragments that may minimize stochastic variation across taxa and are more likely to reflect broader patterns of nucleotide divergence, shorter fragments have many advantages, such as being rapid, easy, and economical to analyze. To the best of our knowledge, no large-scale analyses of the CO1 sequences of Diptera in Egypt have been done. In the present study, the use of molecular techniques provided a DNA extraction method capable of extracting amplifiable mt DNA from immature stages, adult thoracic muscles, and empty puparia. Sequencing of approximately 300 bp of the mt CO1 region appeared to show five species-specific differences. Sequences did not vary in the same species between immature stages and adults. Hence, they were useful in the identification of all life stages. The data obtained would allow an entomologist to distinguish between specimens of Ch. albiceps, Ch. megacephala, L. sericata, C. vicina, and O. capensis in cases where morphological differentiation is difficult. This agrees with the study of Sperling et al., who demonstrated that mt DNA CO1 sequences (along with COII and tRNA leu) could be used to identify the immature larvae of other forensically important Diptera (such as Lucillia illustris, Phormia regina, and Phaenicia sericata). The present study showed interspecific variation of 9% between Ch. megacephala and C. albiceps, which is higher than the 3% variation reported by Wells and Sperling (2001). The maximum intraspecific variability was 0.6%, showing a distinct separation between individuals of different populations of a species, and a separate species altogether. This supports the finding of Wells and Sperling (2001) of an interspecific divergence of ≤3% and intraspecific divergence of ≤1% in a number of forensically significant Calliphoridae species. Hence, calculations of pairwise differences between individuals should provide a useful indication of the validity of a grouping in an analysis. The maximum level of intraspecific variability was observed for Ch. megacephala (0.6%), which is not overly elevated compared to the variability of the worldwide Ch. megacephala specimens reported in previous studies., Moreover, a higher variability value is observed for a congeneric species with forensic importance. Wells and Sperling reported <1% intraspecific level of variation within the CO1 and COII sequence for Chrysomyinae flies. Likewise, Otranto et al. used COI to distinguish between Hypoderma larvae and reported a rate of intraspecific variation ranging from 1.14% to 1.59%. The phylogenetic analyses herein support the subfamily separation at the species level. Each species formed distinct conspecific and monophyletic clusters. In the phylogenetic tree, the monophyletic separation of C. albiceps, C. megacephala, L. sericata, and O. capensis supported by strong bootstrapping values confirmed the sufficient resolution of the genetic marker. This indicated the robust nature of the region that can be used in distinguishing between species. It also reflected apomorphic character states for each group and the level of nucleotide divergence between groups (overall differences). This is consistent with the findings of Yadong et al. (2010) and Liu et al. The forensic utility of any method also depends on a number of factors. The most important are likely accuracy, speed, and cost. The technical accuracy of DNA sequence analysis is known. The appropriate choice of specific primers can readily circumvent common criticisms concerning problems of bacterial and other forms of DNA contamination. DNA extraction, PCR amplification of target fragment(s), and sequencing are routinely completed in <48 h, particularly when short and definitive fragments can be identified and sequenced in only one run. Similarly, the cost for double-strand sequences, such as a short fragment, is low. Hence, this study suggests the short well-conserved mt DNA markers may be reliable, rapidly analyzed, and inexpensive molecular markers used to identify forensically important flies. From the Egyptian perspective, the present study provides a strong foundation for molecular-based phylogenetic analysis of forensically important Diptera species. This is important especially in the case of insect fragments and poorly preserved DNA samples. Egypt's generic taxonomy clearly requires further investigations of intraspecific variations using different markers combinations to consider other forensically important species, such as Sarcophagidae. Some entomologists recommend the combined analysis of different mt DNA fragments for Diptera species identification. The combined analysis of CO1 and COII fragments is a more accurate approach for Diptera species identification than single mt DNA fragment analysis., Finally, technical replicates (parallel PCR and sequencing from the same sample) in barcoding experimental designs need to be performed. Data reproducibility should be determined empirically, as it will depend on the sequencing depth, type of samples, sequence analysis pipeline, and number of replicates. The present study is a step toward the development of molecular tools used in forensic investigations in Egypt. CO1 sequence data appear to provide a strong basis for species identification and a valuable investigative tool in forensic entomology. Feldesman MR. American anthropologist. Forensic Osteological Analysis: A Book of Case Studies. Vol. 103. Scott I. Fairgrieve. Springfield, IL: Charles C. Thomas Publisher; 2001. p. 557-8. Preativatanyou K, Sirisup N, Payungporn S, Poovorawan Y, Thavara U, Tawatsin A, et al. Mitochondrial DNA-based identification of some forensically important blowflies in Thailand. Forensic Sci Int 2010;202:97-101. Byrd JH, Castner JL, editors. Forensic Entomology. 2nd ed. London, New York, Boca Raton: CRC Press LLC; 2001. Wells JD, Sperling FAH. DNA-based identification of forensically important Chrysomyinae (Diptera: Calliphoridae). J Forensic Sci 2001;120:110-5. Harvey ML, Dadour IR, Gaudieri S. Mitochondrial DNA cytochrome oxidase I gene: Potential for distinction between immature stages of some forensically important fly species (Diptera) in Western Australia. Forensic Sci Int 2003;131:134-9. Desmyter S, Gosselin M. COI sequence variability between Chrysomyinae of forensic interest. Forensic Sci Int Genet 2009;3:89-95. Mazzanti M, Alessandrini F, Tagliabracci A, Wells JD, Campobasso CP. DNA degradation and genetic analysis of empty puparia: Genetic identification limits in forensic entomology. Forensic Sci Int 2010;195:99-102. Meiklejohn KA, Wallman JF, Dowton M. DNA-based identification of forensically important Australian Sarcophagidae (Diptera). Int J Legal Med 2011;125:27-32. Kim YH, Shin SE, Ham CS, Kim SY, Ko KS, Jo TH, et al. Molecular identification of Necrophagous muscidae and Sarcophagidae fly species collected in Korea by mitochondrial cytochrome C oxidase subunit I nucleotide sequences. ScientificWorldJournal 2014;2014:275085. Harrison RG. Animal mitochondrial DNA as a genetic marker in population and evolutionary biology. Trends Ecol Evol 1989;4:6-11. Nelson LA, Wallman JF, Dowton M. Using COI barcodes to identify forensically and medically important blowflies. Med Vet Entomol 2007;21:44-52. Gupta MP, Sharma K, Khan BU, Kapoor BC, Bajpai PK, Kumar A et al. Tissue specific esterase isozyme variation in Clarias batrachus and C. gariepinus. Global J Pharm 2009;3:1-5. Nga TT, Anh TT, Huyen DT, Son NT, Thong VD, Sang NV, et al. Assessment of genetic relationship of some horseshoe bats (Chiroptera: Rhinolophidae) in vietnam using cytochromoxydase subunit I (COI) gene sequence. VNU J Sci Natl Sci Technol 2016;32:329-35. Khullar N, Singh D, Jha CK. Short COI marker: A valuable tool for identification and phylogenetic analysis of 6 forensically important blow fly species from India. J Entomol Zool Stud 2016;4:27-31. Hinton HE. A Monograph of the Beetles Associated with Stored Products. Vol. 1. London: British Museum (Natural History); 1945. Smith KG. A Manual of Forensic Entomology. Ithaca, New York, London: British Museum (Natural History, Cornell University Press; 1986. Mound L. Common Insect Pests of Stored Food Products. 7th ed. London: British Museum (Natural History); 1989. Greenberg B, Kunich JC. Entomology and the Law: Flies as Forensic Indicators. Cambridge UK: Cambridge University Press; 2002. Castner JL. General entomology and arthropod biology. In: Byrd JH, Castner JL, editors. The Utility of Arthropods in Legal Investigations. Florida, Boca Raton: CRC Press LLC; 2010. p. 17-38. Delarbre C, Spruyt N, Delmarre C, Gallut C, Barriel V, Janvier P, et al. The complete nucleotide sequence of the mitochondrial DNA of the dogfish, Scyliorhinus canicula. Genetics 1998;150:331-44. Sperling FA, Anderson GS, Hickey DA. A DNA-based approach to the identification of insect species used for postmortem interval estimation. J Forensic Sci 1994;39:418-27. Wells JD, Sperling FA. 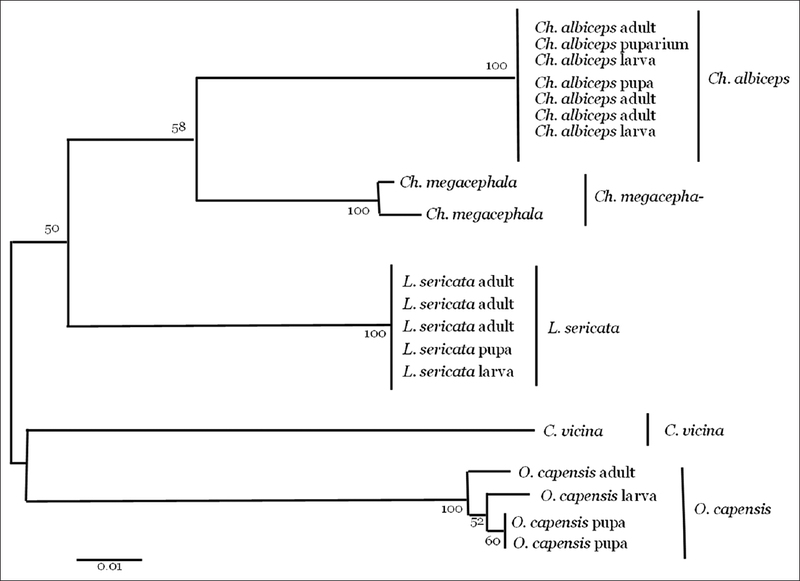 Molecular phylogeny of Chrysomya albiceps and C. Rufifacies (Diptera: Calliphoridae). J Med Entomol 1999;36:222-6. Simon C, Frati F, Beckenbach A, Crespi B, Liu H, Flook P. Evolution, weighting, and phylogenetic utility of mitochondrial gene sequences and a compilation of conserved polymerase chain reaction primers. Ann Entomol Soc Am 1994;87:651-701. Hall TA. BioEdit: A user-friendly biological sequence alignment editor and analysis program for windows 95/98/NT. Nucleic Acids Symp Ser 1999;41:95-8. Tamura K, Dudley J, Nei M, Kumar S. MEGA4: Molecular evolutionary genetics analysis (MEGA) software version 4.0. Mol Biol Evol 2007;24:1596-9. Aly SM. Reliability of long vs. short COI markers in identification of forensically important flies. Croat Med J 2014;55:19-26. Guo YD, Cai JF, Meng FM, Chang YF, Gu Y, Lan LM, et al. Identification of forensically important flesh flies based on a shorter fragment of the cytochrome oxidase subunit I gene in China. Med Vet Entomol 2012;26:307-13. Liu Q, Cai J, Guo Y, Wang X, Gu Y, Wen J, et al. Identification of forensically significant calliphorids based on mitochondrial DNA cytochrome oxidase I (COI) gene in China. Forensic Sci Int 2011;207:e64-5. Otranto D, Traversa D, Guida B, Tarsitano E, Fiorente P, Stevens JR. Molecular characterization of the mitochondrial cytochrome oxidase I gene of Oestridae species causing obligate myiasis. Med Vet Entomol 2003;17:307-15. Yadong G, Jifeng C, Xinghua W, Lingmei L, Qinlai L, Xiang L, et al. Identification of forensically important sarcophagid flies (Diptera: Sarcophagidae) based on COI gene in China. Rom J Leg Med 2010;18:217-24. Stevens J, Wall R. Genetic relationships between blowflies (Calliphoridae) of forensic importance. Forensic Sci Int 2001;120:116-23. Amendt J, Krettek R, Zehner R. Forensic entomology. Naturwissenschaften 2004;91:51-65. Wallman JF, Donnellan SC. The utility of mitochondrial DNA sequences for the identification of forensically important blowflies (Diptera: Calliphoridae) in Southeastern Australia. Forensic Sci Int 2001;120:60-7. Alessandrini F, Mazzanti M, Onofri V, Turchi C, Tagliabracci A. MtDNA analysis for genetic identification of forensically important insects. Forensic Sci Int Genet 2008;1:584-5. Leray M, Knowlton N. Random sampling causes the low reproducibility of rare eukaryotic OTUs in illumina COI metabarcoding. PeerJ 2017;5:e3006.